You know how sometimes you have those days and you look back and go, "how the heck did I get all that done?!" well this was one of those days. 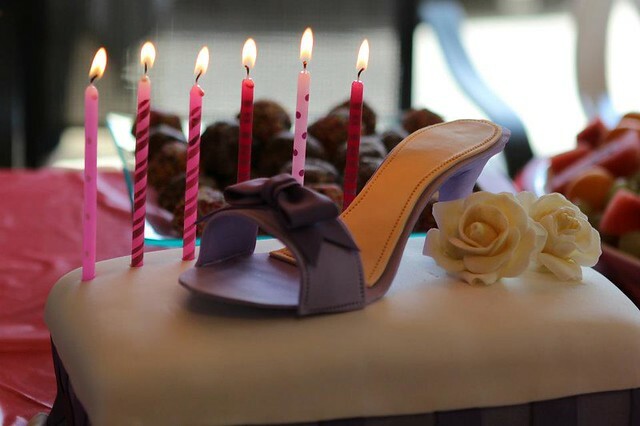 I had this cake all planned out and made the shoe in advance. But then I heard the sad news that a relative passed away and the funeral was the same day as the cake was due so I sped up the process and had the cake picked up on Thursday night instead of Saturday. 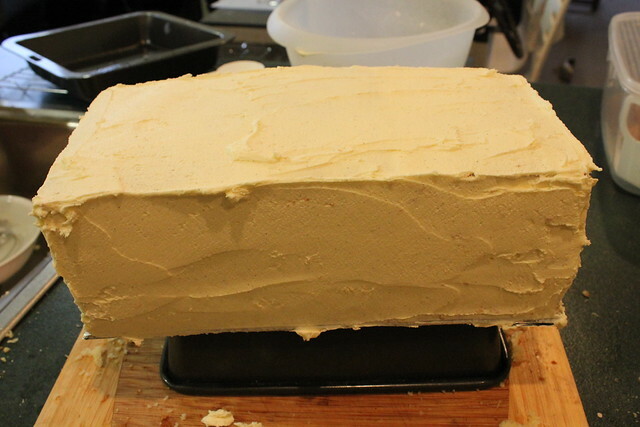 So on Wednesday night I spent five hours STRAIGHT in the kitchen, on my feet, cutting, icing and decorating this cake just so it would be ready in time for the next day. I don't think I've ever made a cake so fast but I was really happy with it! 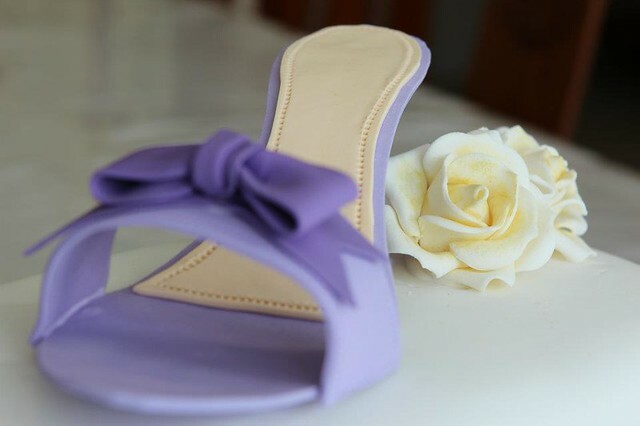 I made the heel of the shoe two weeks prior, I made the bow and roses about three days prior, baked the cakes on Tuesday and Wednesday (thanks for Hubby once again!) and everything else I put together on that frightful Wednesday night. My poor feet! It wasn't all smooth sailing either! 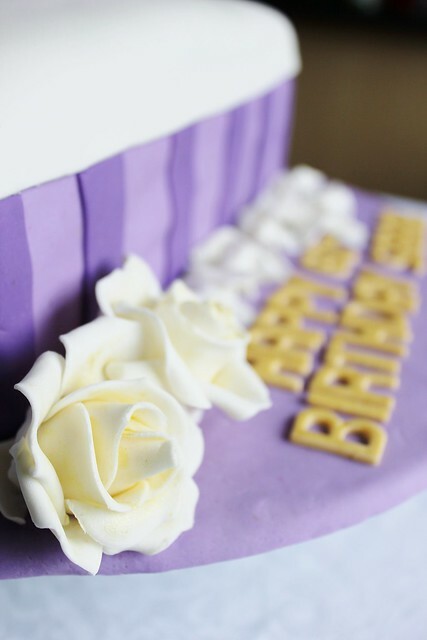 After reading this blog post on preventing purple fondant from fading I added 2t baking soda to my mass of purple fondant and after kneading it for a while it went really weird and bubbly! Not good! I wasn't sure if this was from the baking soda or the heat but it tasted fine so I just went with it. I was really worried that the bubbliness would look really obvious but I think once I added everything else to the cake it didn't matter. 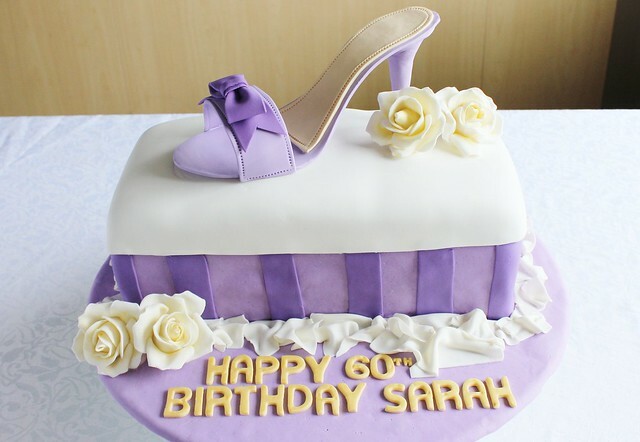 So that was the story of my 60th Stiletto Shoe Cake. You might be interested to know (much like having the Thomas the Tank Engine theme song in my head for the Thomas cake) I had Girl in Stilettos in my head the whole time! Here are some great photos from the party, thanks to Fraser for the photos! I bought a cheap ($5!) 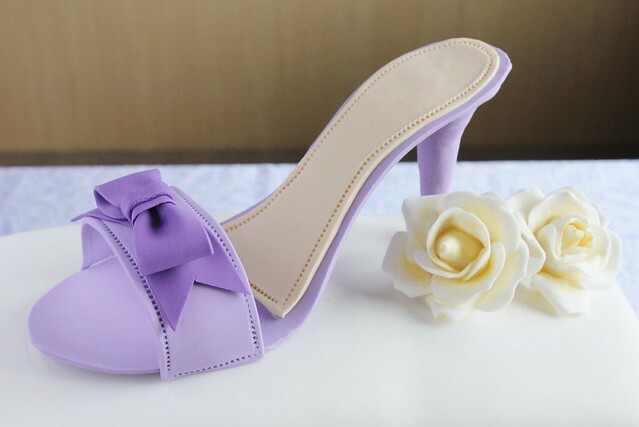 pair of heels in a small size (so that the cake wouldn't have to be so big) which I modelled the gumpaste on. The tutorial I found was great, it tells you exactly when to make each thing, you have to start making the heel about two or three weeks before the cake is due. 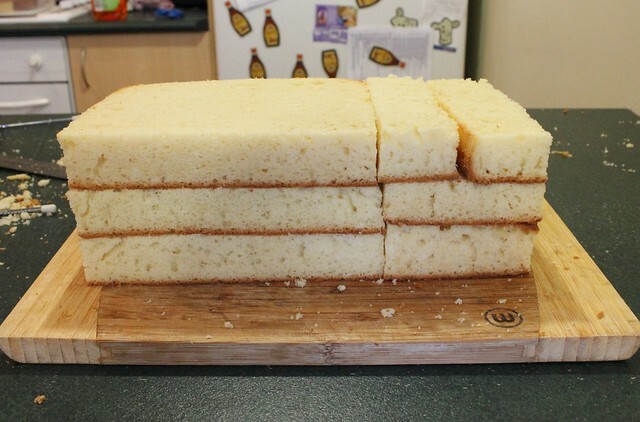 I made three vanilla cakes in square tins then cut them to be the same size as the shoe box the shoes came in. 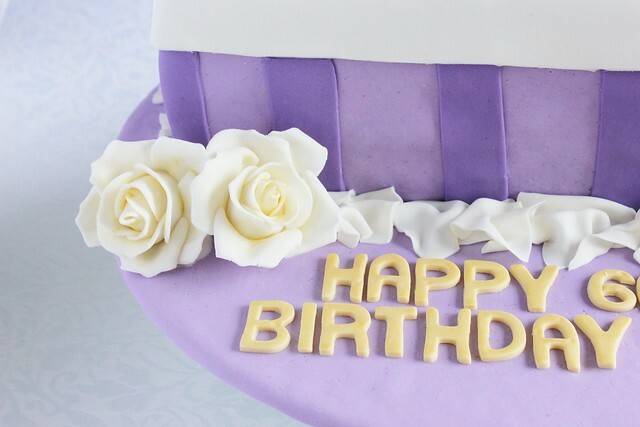 I then covered it with buttercream then with purple fondant. 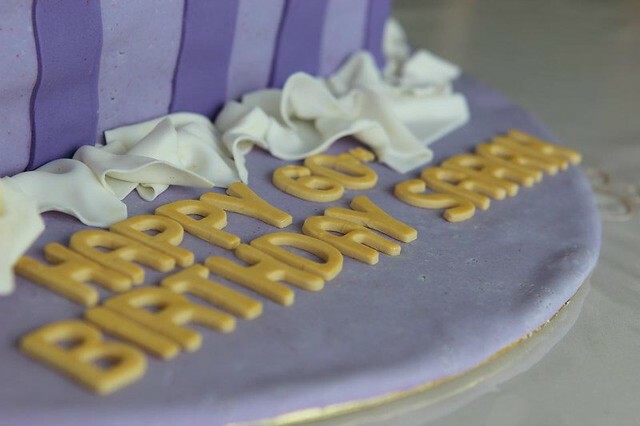 Purple fondant fades so if you are doing these colours make sure you put the cake in a cupboard away from UV light when you're not working on it. 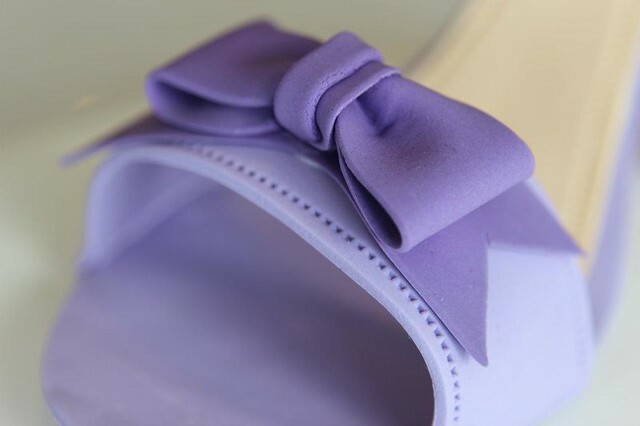 I covered the cake board with the same colour purple fondant and made stripes for the shoe box in a darker purple colour. I rolled out thick white fondant and placed this on top of the cake then trimmed the sides using a metal ruler and a knife. I used a mixture (about 50/50) of gumpaste and white fondant rolled out REALLY thin then cut out small squares for the tissue paper around the edges. I just sort of played with it until it looks right and left little bits of tissue in the crevasses so that it would dry that way overnight. The writing is just yellowy brown fondant with gold lustre dust painted on the outside. I also used the gold lustre dust on the roses to tie in the gold theme. I used the same rose tutorial as the one I used for Andrina & Brent's wedding cake. I think I'm starting to get a shoe cake reputation! I did the Converse Chuck Taylor cake for hubby, then the Nike Kicks cake, this High Heel cake and have already been asked to make an Adidas Shoe cake later on in the year! Good thing I like shoes! I love the colours. Very classy. The detail you have done is incredible. This is amazing work. It's hard to believe that this is edible. I wouldn't want to hurt it. Well done for a speedy job. This is absolutely stunning!! My gosh, I'm completely blown away. And how awesome are you with fondant?! Amazing. Hello and thanks for visiting my blog. It was so lovely to discover yours - how talented you are and how professional those cakes look. Hours of patience - something I don't have, I'm afraid. Loved your blog. What a beautiful cake, love it! I bet the Sarah who it was for loved it too. Gorgeous. This is incredible! What a beautiful cake! WOW!! 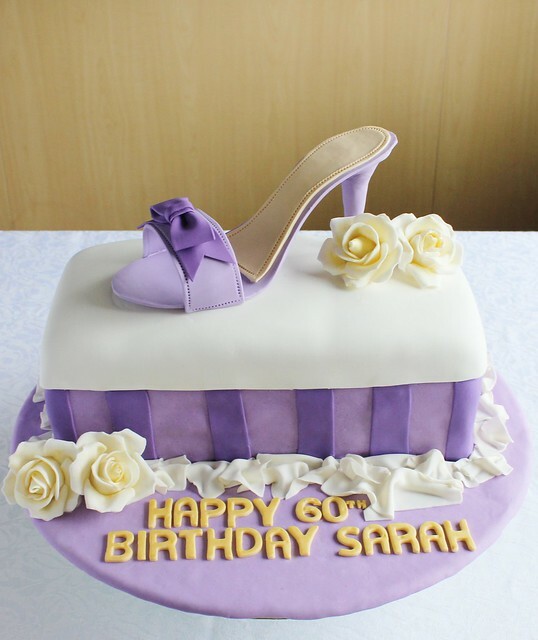 how gorgeous, I've just done a shoe box and stiletto shoe cake also, and like you, had to do it all in one day. What a mission, but the result is worth the effort.